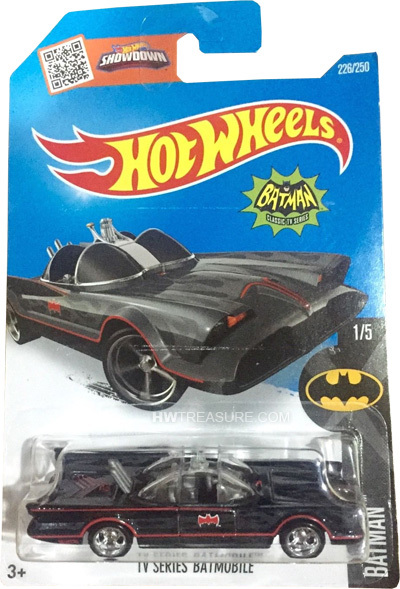 226/250 is part of the 2016 Super Treasure Hunt set and 1/5 in the Batman series. The iconic black car features red graphics, red pin stripes, a red bat logo outlined in white on the doors, and “TH” on the trunk. Dark gray flames can be found on the hood and trunk. 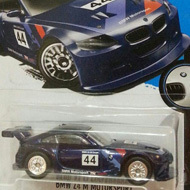 The car has clear windows, a gray interior, Real Rider 5-Spoke Mag-Style wheels, and a black plastic Malaysia base. 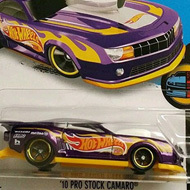 This vehicle can be found in mix “J” of 2016 Hot Wheels mainline cases. The Batmobile made its debut in the 2007 New Models series. It is based upon the car used in the 1966 Batman TV series.